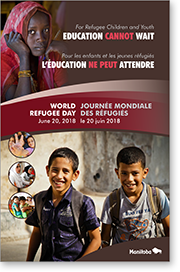 This poster, commemorating World Refugee Day 2018, held annually on June 20, is intended to promote the recognition of this special day in Manitoba schools. This document is intended to serve as a resource for educators and schools seeking to respond to the needs of their religiously diverse students and community. The document provides a guide for welcoming religious diversity and providing accommodations in Manitoba schools. Both an interactive PDF version and a print PDF version of Building Hope: Refugee Learner Narratives (2015) are available. This document is intended to help strengthen the capacity of school communities at all levels (early, middle, and senior years) to provide an appropriate and supportive school environment for refugee and war-affected learners and their families. The core of the document is the stories or ‘learner narratives’ of eleven young Canadians of refugee or war-affected backgrounds who were interviewed about their experiences before coming to Canada and their immigration life since then, with emphasis on their education pathways. Manitoba has changed from using the term English as a Second Language (ESL) programming to English as an Additional Language (EAL) programming. Life After War: Education as a Healing Process for Refugee and War-Affected Children and the two companion documents Life After War: Professional Learning, Agencies, and Community Supports and War Affected Children: A Comprehensive Bibliography are web-based resources that are intended to help strengthen the capacity of school communities at all levels (early, middle, and senior years) to provide an appropriate and supportive school environment for refugee and war-affected learners and their families, an environment that will nurture their mental health and well-being and enhance their educational and life outcomes. Please note that Life After War: Education as a Healing Process for Refugee and War-Affected Children is also available in print form and may be ordered from the Manitoba Learning Resource Centre. Manitoba Kindergarten to Grade 12 Curriculum Framework for English as an Additional Language (EAL) and Literacy, Academics, and Language (LAL) Programming, Draft for Consultation and Review, June 2011. The final version of the EAL/LAL Curriculum Framework is in press. Please contact Diana Turner or Jayesh Maniar for further information. English As An Additional Language/English As A Second Language, Kindergarten to Grade 12 Manitoba Recommended Learning Resources. Also available in print from Manitoba Learning Resource Centre (formerly the Manitoba Text Book Bureau), Stock #80568. The Special Language Credit Option is a challenge-for-credit mechanism that allows students in the Senior Years (high school) to obtain credits for proficiency in languages other than English or French, which are the two official languages of instruction in Manitoba. The languages for which students successfully challenge for credit vary from year to year.